It's better to plant a little high than too deep. Keep the root ball moist - don't let it dry out - for the first year or so, until new roots are established. 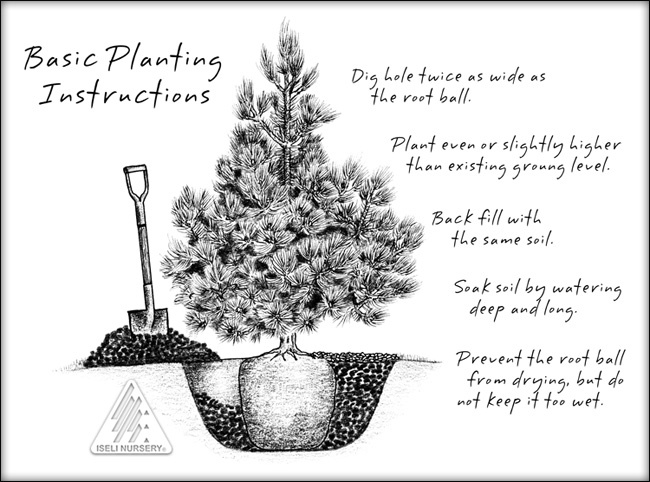 Hole and soil preparation: Dig the planting hole a minimum of twice the width of the root ball but no deeper. The depth of the hole should allow solid ground below the root mass resulting in the root flare at the top of the root mass to be slightly higher than the finish grade of the planting. The soil must have good drainage. Amend the soil that is removed from the hole with mulch, compost or good potting soil at a ratio of 1 shovel full of mulch to 1 of soil; blend well. This is especially important when it is clay soil. Before planting, carefully loosen the roots all around the root ball. If the plant is root bound use a knife or shears to loosen up the root mass on sides and bottom. Place plant in the prepared hole being sure the root flare is slightly above ground. Place mycorrhizal fungi Tea Bags begin filling in around the plant with the amended soil. Water well before the hole is filled to remove air pockets then water again when the planting is complete. Apply no more than 2" of mulch on top of the root ball being sure it does not touch the bark of the plant. Once your planting hole is dug place your new plant in the hole then simply place the biodegradable tea bags evenly around the outside roots or root ball, make sure the tea bags remain touching the roots as you fill with soil. Watering: Do not allow your plant to dry out (Good Drainage is a must here). Adjust your watering to your specific climate. During summer/dry weather, water deeply once or twice a week, slowly soaking the area around the plant to a depth of 4". Do not overwater. If the soil is wet, do not add water. It can be beneficial to contain water by creating a slight "well" around the plant so the water can't run off. Once the plant is established or prior to heavy rains return soil around plant to natural grade so the plant does not drown in a mini pond. Fertilizing: If you desire to fertilize, make sure to use a starter or slow release or organic product, insuring protection for tender new root growth. In the spring of the following season a fertilizer for mature plants may be used if your soil requires additional nutrition. Never allow fertilizer to contact plant foliage as it may burn the plant and cause severe dieback.